Many of you know about me from my first book, “Confessions of a Childfree Woman: A Life Spent Swimming against The Mainstream”, Amazon. It took almost three years of writing to have the final accomplishment in my hands and hopefully, yours. Looking back, it was worth every agony and every rejection I met to receive the outpouring of love and support for my memoir. I know that feeling because reading the first book about the childfree lifestyle I got, “The Baby Trap”, by Ellen Peck, set me free to be proud of being a non-parent. When my editor suggested it may be time to update my memoir, I agreed. However, it wasn’t long before we knew I was gestating another book. The birth of book 2 is now eminent. Without a doubt, I’m humbled and honored to feel it will help more of my childfree family. Today, I finished a chapter that had me crying. It wasn’t because I heard the word, “REVISE” from Justine. It was because she said, “Marcia, this is the best writing I’ve seen from you”. countries where you may face the wrath of others. You are the ones who inspired me to see how much we still need to make this a viable respected lifestyle allover the world! I’m still breathless with feeling humbled and excited in writing this book and seeing the end in sight. I can’t wait to let you know it’s birthed. you’re affecting the lives of others for the better. And, if it’s simply our own life, that’s also wonderful. This may be one of those highlights of my 74 years on this planet. http://thenotmom.com/the-notmom-summit-2017/this Oct, 6-8th in Cleveland Ohio. Without a doubt, those who attend will leave with a renewed and inspirational excitement for the childfree lifestyle. Those sitting on the fence will hear why it may be a good idea to jump off that fence and wrap your hearts around a way to happiness you never imagined. but are only perpetuating the myths they’ve been lead to believe is an assumed biological destiny for all. I’m honored and overwhelmed at the opportunities I have with the other presenters to reach your hearts. I also look forward to meeting as many of my peeps as I can! Our NOKID GROUP CRUISE. WHY? Cruises are virtually all-inclusive vacations. One price includes all accommodations, meals, many activities on board the ship, and entertainment. By traveling as a group, we’ll qualify for special group discounts and rates. With a Group Cruise, you unpack once and let the ship’s crew do the rest. Our cruise ship offer something for everyone regardless of their interests or personality. There’s plenty to keep every member of the group entertained. We still have a number of different types of staterooms for any budget including: inside cabins, suites, balcony staterooms, and ocean view staterooms. We also have “The Haven” with a private butler, restaurant, spa privileges and awesome additional amenities! There’s maximum flexibility available for group dining on our cruise ship. Our group can elect to dine together or choose independent dining options. Our cruise ship offers first-rate award winning Broadway and Las Vegas-style musical revues; comedians; magic shows; piano bars; high energy discos; and live music to keep us entertained from sun down to sun up. The casino is also fun. You can use your on board credit there! A Group Cruise gives us a chance to share a common experience, which is choosing the childfree lifestyle and never hearing, “So? How many kids do you have? Our group activities like our private dinners first and last nights at sea, late night fun, and festivities will help us get to know one another. Cruises have the highest guest satisfaction rating in the entire travel industry. Cruise Line studies show that groups that travel together on a cruise will return again as a group within two years of their first trip. We’ll be doing this on our Get-A-Way NCL cruise along the Mexican Coast, December 3-10th, 2017! Our special group pricing and amenities ends soon. Will you be with us? I’LL BE HOSTING AND SPEAKING! It’s that time of the year again. I recently saw a post from a childfree couple who “lost it” for this holiday season. The questioned whether or not having children or grandkids had any influence. I sighed. Then, thought how their choice of the words “lost it” could easily change with the words, “got it back”. Holiday excitement can be very taxing on childfree couples if at every party they’re asked when they will settle down, or if they feel lonely not having kids during the holidays. It’s simply pronatalistic myths. Many people share with me the delight they have in decorating their homes. Indeed, many are single. Some have animals. Others have a life-partner. They love decorating, hosting parties, going to parties and feeling the delicious freedom not having kids gives to us. 2. Invite friends to your home! Maybe those neighbors who have kids who AREN’T visiting them? 4. Go out for a lovely dinner and sleep late the next AM because you can. Parents can’t! 5. Volunteer at a local shelter or soup kitchen. 6. See if there’s a need at BOYS and GIRLS Clubs! Many come from homes where they can’t afford any decorations. 7. Watch those sappy holiday movies while munching on your favorite goodies, chocolate or sipping your favorite wine or drinks. 10. Have gratitude for your own delights, the people who give you joy and the fun of this season. CELEBRATE! DECORATE! We leave on Dec 3, 2017 (That’s over a year and a half from now!) We cruise on the same ship: NCL’S Getaway down the Mexican Riviera coast stopping at Roatan Bay Islands, Harvest Caye, Belize, Costa Maya and Cozumel. You can purchase shore excursions to see the Mayan Ruins, take a thrilling ZIP line experience, swim, snorkel on a private island or kiss a dolphin. Pricing starts at 489.00 pp for an Inside cabin. (You just read that right.) For more pricing on ocean view cabins and balconies and The Haven, a ship within a ship with a butler…go to NOKIDCRUISE@gmail.com. I’ll attach information. But hurry. These prices and first choice cabins will go back to NCL on 9/14/2016. You’ll also get 4 specialty dining meals FREE and 75.00 per cabin on board credit. Only 50.00 assures you a place. 125.00 pp gets your name on your chosen cabin. All money is refundable up to 120 days from sailing. Singles can purchase a studio cabin and not have to pay double as all other cruise ships insist upon. They are going fast! Hoping to give and get hugs on a trip to make a lifetime memory. We all face rejection. It’s part of being human. It’s not enjoyable. A flood of emotions come up when we hear, “You’re wrong”! “Or, “I don’t like you.” We cringe and want to deflect that opinion. We’re right. They’re wrong. Damn it. Then comes the usual push and pull dance trying to prove our point. Words get more hostile. Emotions feel raw as if our heart has been attacked with a sharp knife. Blood pressure rises. Some may get their ugly face dissolving into tears of frustration. We can’t get through to them. Why can’t we get through to them? After being on “60Minutes” announcing I never wanted to have or raise children, I was let go from my teaching Job. Mike Wallace ended that show with, “Pardon our perversion for airing this on Mother’s day. Good night everyone”. I was rejected as a perverse woman. How could I be an effective teacher when, in the minds of ignorant people, I never wanted to have children? I must be a child hater. It never dawned on them to think how inaccurate that assumption could be. Just because people don’t want to have or raise kids doesn’t mean they hate children. Of course, had that been the truth, it would have been proven before then. Children would come home wailing or complaining that their teacher is awful. Instead, the principals and Board of Education had glowing letters of praise for my creative teaching skills and obvious love of helping their children. That pain of that rejection had a far lasting legacy. I was black listed from teaching for ten years until I remarried, changed my name and got back into teaching. I went on to be nominated by my peers to Walt Disney’s National Teacher of the Year. I lost. However, I felt honored for that nomination. It helped ease that pain of rejection but never stopped the loss I’ve suffered which, to this day, is reflected in my pension. Rejection hurts, if we allow it. It seems more painful when it comes from family. We’ve heard blood is thicker than water. We’ve been lead to believe our family will be there for us. However, it’s a myth. Myths are created and perpetuated by assumptions. Reality changes that time after time. Many of my followers on Facebook have shared their heartfelt pain when their family rejected them for their personal choice to remain childfree. One woman told me her father told her he stopped her abortion! Now he felt it was a mistake as she would never give him grandchildren. Those words were catastrophic to hear. She asked me how can she stop the pain. Here’s what I’ve learned. You can’t change people’s minds, misperceptions or expectations. They’re claimed by those who fiercely hold on to them. The only importance is how our own lives are affected. Is it painful to see we’re rejected for any personal thought, believe or lifestyle ? You bet it is. Can it lead us to feel sadness, hurt, or bewilderment? Sadly, yes. Might we even start re-thinking or asking ourselves if we need to change to fit into the accepted way of thinking? It sure would be easier. But, would we lose who we are? Would that be the biggest loss to ourselves and those whose lives we could touch in a positive way? Remember what I’ve learned as an aging woman. If we stay focused on the negative emotions, we remain a victim. If we let go, wish others well on their own paths, (sometimes, a bit daunting, I admit) we stand a chance to enjoy this awesome thing called life. It’s so ephemeral! Suddenly, you’re looking at the sands of time trickling down, down, down to what we know is the end. If this is the moment, be in it. Wrap your hearts around your own needs and wants. It’s not selfish. It’s loving yourself. Wish those who differ love and peace in their choices. Don’t argue. Don’t defend. Reach out to those who care. If it’s not that family you were born into, make your own. No! Not by procreation. By choosing others who respect, love and treasure you in their lives. I treasure you. I think of you as an extended family.I’m here for you if you need me. 2nd Annual Childfree Group Cruise! Coming back after our first successful childfree group cruise, there was only one thing on my mind; I had to arrange this again. The experiences we enjoyed will last a lifetime. The sharing in our private meetings touched our hearts. Laura Scott, author of, “Two IS Enough” was perfection as she helped many to see the beauty in the childfree lifestyle. We laughed, cried and enjoyed the splendor of a first class ship with all the amenities. I shared the infamous “60 Minutes” tape that caused me to lose my job. The food was delicious. The service amazing, The itinerary was fun and varied. We’ll remember the warm, crystal blue waters of The Bahamas and Caribbean. 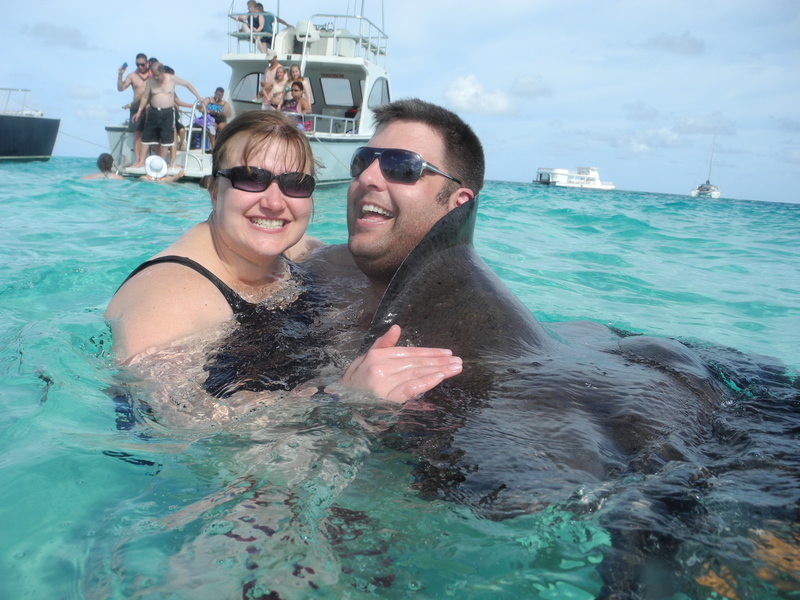 JIm and I will remember kissing a dolphin in The Cayman Islands. Our cabins were spacious and comfortable. It’s my pleasure to announce our second annual cruise is now open for reservations. We’ll have many more opportunities to meet with like minded people, hear awesome guest speakers and enjoy the itinerary to: The Virgin Island, Tortola and Nassau. This time, it’s on Norwegian’s newest ship, The Escape.We leave December 10-17th from Miami, Florida, USA. Stay on the video for the detailed tour of the ship and cabins. Then, send me your name and email to NOKIDCRUISE@gmail.com for more info and pricing. But hurry! Reservations are going fast. See you on board for real hugs! WE BIRTHED A CHILDFREE GROUP CRUISE! It’s official. I’m super excited to announce we have a HAPPY2BCHILDFREE group cruise on a luxurious Norwegian Cruise-line. this December 2015. Additionally, single people may be able to get a studio inside cabin just for yourself with no added costs as most other cruise-lines charge! They’ll be the first to go. So……..come with us. Don’t wait too long as cabins are going fast. I’ll send you a link to tour the ship, virtually. Let’s make memories to last a lifetime. Having fought cancer and won, I’ve learned the importance of being with like-minded friends and relishing the joy of fun experiences. I have hugs waiting!